Sorry, this offer is no longer available. Please check out our current list of freebies. Get up to two free college t-shirts from My Coke Rewards. Collect codes from six caps from 20-oz bottles of any Coca-Cola product. 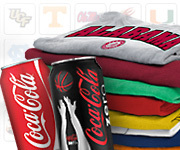 Then enter those codes at My Coke Rewards with the promotion code NCAATSHIRT. You’ll be able to choose from 66 different NCAA schools. All shirts are size XL and you’ll get free shipping. The other way to get a free college t-shirt is to buy 2 specially-marked 20-can packs of Coke or Coke Zero at a participating retailer. Enter the codes from the boxes and get your free size XL college shirt. There is a limit of 2 free NCAA t-shirts per person and the offer is good until 4/30/11 or while supplies last. Expect your free t-shirt to arrive in 10 to 14 weeks. The site will only let you enter codes from the 20 can packs to get the shirts. @ laina – Try again! When you enter the code NCAATSHIRT, it will let you enter the codes from the 20 oz bottles to get the t-shirts. I’ve already requested one and am scrounging up more caps to get another one. I cant find the tshirts. Help!! @Laina- I entered codes from 2 liter bottles and it worked just fine. @ Patty – try entering the NCAATSHIRT code first, and then you’ll see the offer. can you use points you already accumulated? I entered ncaatshirt entered my codes. What next? Please help. I’m with Iaina, can we use accumulated pts? I have over 2,800 pts, I’m sure lots of them were from 20 oz bottles!! How cool… I entered the NCAATSHIRT, then 6 codes, and it let me pick from 50 different schools. Plus I was able to enter 5 times in the sweepstakes, too! Thanks so much for this, because I knew nothing about it. @ Patty – Have you had any luck figuring it out? @ Amanda – you should be able to enter the code again and it should bring you to the offer. Ok, so I have codes for 3 cases of cokes, entered ncaatshirt, it tallied my points but how do I get my shirts? Help please. This code has already been redeemed on My Coke Rewards. Please try another or check our FAQs where you can find answers to common problems. @ Amanda and @ Deb – Hmmm… that’s weird. I’ve been able to enter the code more than once and see the offer. If you enter NCAATSHIRT there, does that work? @ Deb – Just re-read your comment… it has to be six 20-oz bottles with the code to get the shirt…. if you have two 20 packs purchased at participating stores, then you can get a shirt, too. (You should see that offer when you log in). @Amanda – YAY! I’m glad you were able to get it! I entered my codes, and all it does is take me back to the page that says find retailers. This sux. I bought 2 cases of product and no tshirt. @ Deb – I’m sorry it’s not working for you. When you log-in, and go to this link, does the offer show up for you? Call 866-674-2653 between 9:00 AM and 7:00 PM ET, Monday through Friday. Hope you are able to get your free shirt! I didn’t see this offer until after I had entered several codes this week. Yet, when I entered the ncaatshirt code in the code-box and it allowed me to choose a shirt. I wish the shirts came in a smaller size but I’ll find someone to wear it. Keep working, nice post! It was the info I needed to know.